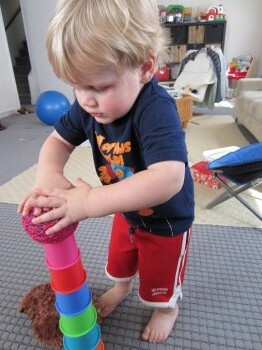 So Oscar turned two in January and is starting to become more interested in imaginative play. He loves reading and watching TV now for the stories and not just the pictures. It’s a really fun transition and I am enjoying just observing him. We spend most of our waking hours together and interacting and I started to wonder if it was time to incorporate some alone time. Typically, the end of the day is when I do this because we are antsy and bored and I need to make dinner. In the past Oscar has been underfoot or if daddy got home early, they would go outside. But now we have a third option – room-time! I experimented with room-time a week or two ago to see how it would pan out. I made sure Oscar was safely in his room with plenty of books and toys and walked away. Yes, he yelled for me a couple of times (Hey MAMA! MAAAAMA! ), but eventually decided to read and play with his blocks while I prepared dinner. I am pretty sure this is awesome. I decided to ask some of my friends what they thought about letting toddlers entertain themselves and here is what they had to say! It’s hard to know exactly when to make this transition. I suppose like everything else, it just depends on the child. I probably could have started sooner, but at the same time he is pretty good at entertaining himself with me in the room so I didn’t feel like I needed to. That said, I do believe that everyone needs some alone time in their day, whether two years old or 32. I have to admit that I enjoy the chance to stand over the stove without a 38lb boy wedging his body between me and the counter 🙂 I think we will stick with our daily room-time and hopefully Oscar’s imagination will only flourish as a result! Do you give your toddler alone time during the day? What works best for you? Alone-Time is my sanity. Since we basically lost nap-time at age 2… alone-time is beneficial for everyone. Sometimes constant stimulation, even from other people can keep him wound up but a few minutes of alone-time is a great way to get him to wind down. Yes, for sure. I bet we started this earlier than many. Oldest is 28 months and does a pretty age-appropriate job with independent play. Younger is 10 months and does well playing with his brother. You are right, though, I think personal space benefits us all.